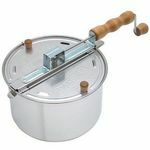 I love this popper, makes perfect popcorn every time! 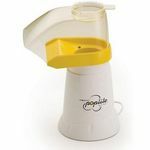 I love this popper, it's easy to use and clean!! At first I was over the moon excited about my Whirley-Pop but after just a few uses I find the hand crank gets stuck and you have to spin it backwards then forwards to get the blades to spin. I don't know if the kernels get trapped under it or if it's bent somewhere we can't see. 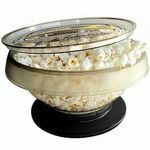 9 times out of 10 we go for the ease of microwave popcorn instead of the Whirley-Pop. My friend recommend I get a whirley pop, and I love it so much! I use to only make popcorn in the microwave which is not as healthy. It takes me about five minutes to make a batch of popcorn and the whole family loves it. I also buy Gold Medal Glaze pop in grape, cherry, and caramel for something different other than butter. The whirley pop is a fun popcorn popper to own. I recieved this as a gift. It is more difficult to clean than the normal pot I usually use. It pops more kernels but is not worth it once the popcorn is done and it's clean up time. 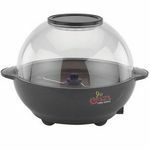 I love this popcorn maker,it is easy to use, easy to clean and fun!! The instructions are simple and easy to follow. I use 1/4 cup of popcorn for just me, or 1/2 cup for 2-4 of us. I hardly ever have any unpopped kernels. It only takes 3-5 minutes to make fresh delicious popcorn! I love this device! It allows my family to eat popcorn a lot cheaper. In addition to saving money it is also healthier to eat because there are not preservatives like microwave popcorn. We love the whirley-pop in this household. We don't buy microwave popcorn. We prefer to make it ourselves without all the chemicals that are put in microwave popcorn bags. Our favorite way to use the whirley-pop is making kettle corn. 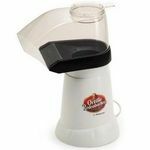 It makes the sweet popcorn perfectly sweet and keeps the sugar evenly distributed without burning the sugar. I wouldn't make kettle corn any other way. The whirley pop is so easy to use. All you have to do is add oil and the popcorn and turn the crank for 3 minutes over medium heat. Or medium-high if you use an electric oven. Our first whirley-pop lasted for an entire year before it started falling apart. The parts of the popper that help keep the long metal piece moving around and stirring the popcorn actually started coming off and wouldn't stay on very well. So we bought a new one. But I just recently found out that if I had registered the first one, we could've gotten a new one for free. If you register it with their website you get a lifetime warranty on it. Wish I'd known it before. Ease of Cleaning It is pretty easy to clean, but it's a little awkward with the top piece because of the shape. My family eats a lot of popcorn. when you use microwave popcorn it gets expensive quickly. In addition to the costs, I worry about the preservatives and chemicals in microwave popcorn that my family is ingesting on a daily basis. A friend suggested this, and not only does it save on money its healthier for the family too! An added bonus is you can also buy different flavors of popcorn to flavor your homemade popcorn and buy oils that make it taste as if you are in the movie theatre! I haven't burnt any popcorn with this device though I often did with microwave bags. In addition the costs of popcorn has significantly decreased in my household, the popcorn tastes better AND its healthier! I plan to buy a second one soon because I love it so much! I would recommend this for anyone who loves popcorn! Performance Works like a champ I love it! I still cant believe how much popcorn it pops at once! Settings/Features The only thing you have to do is spin the crank which is easy and fun for the whole family to take turns doing. Ease of Cleaning Very easy to clean just wipe it out with a paper towel. Ease of Use Couldn't work easier. Durability It works well and has lasted us for quite some time I plan to buy a second, not because im afraid the first will go out, but simply so we can make double batches! A Popcorn Lovers Dream Machine! You will love this is you love popcorn. Brings back the good old days when popcorn was popcorn and not fluffy cotton out of a microwave bag. Trust me popcorn lovers. You will be delighted with your purchase. Performance Honestly does not get any better than this. I am a big fan of movie theatre popcorn but this beats even that. The delicious texture and flavor make it tough to quit eating it. Settings/Features Throw in the oil, drop in the kernels and then hear the sizzle and pop as you swish and get ready. I have had occassions whereby every single kernel actually popped. Ease of Cleaning Does require some cleaning as would any appliance that includes oil. As long as you don't burn the corn and keep an eye on things you will be fine. Ease of Use I think a big part of the popcorn making is the fun of doing it with someone else. It's easy to use and you can hear when you get to the end. Very little waste and great popcorn crunch. Perfect texture every time. Durability Very durable. Tough and meets the demands of the popcorn fanatic. Eat all the popcorn you want. You will be absolutely thrilled that you made this purchase. If you like strong, durable equipment, this one is top-notch.